Boarded horses are given a tailored nutrition and turnout program and are cared for as our own. 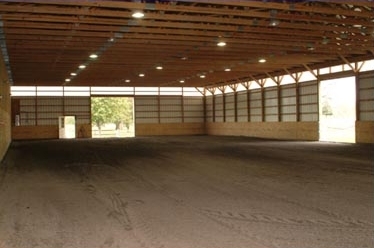 Both the indoor ring and off-farm trails are available for riding. We have the knowledge, ability and facility to look after retiring or laid-up faithful equine friends. The eventual aim for each horse is to provide a small herd situation to allow your horse to 'be a horse'. Those coming for rest or injury recovery will receive care as prescribed by your veterinarian or trainer, and our own veterinarian can assist as needed to monitor progress. Farrier attention will be scheduled as needed and all horses on the farm undergo a de-worming protocol on a year-round program. 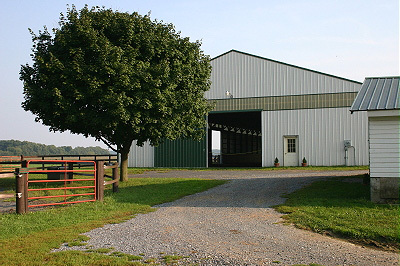 We occasionally have space for a live-out working student to learn care and working of the horses, as well as possible show riding opportunities. Please contact us for details and availability.